A New History of the Book of Common Prayer with a Rationale of its Offices is one of the classics texts concerning the Book of Common Prayer. The book was first published in 1855 under the title A History of the Book of Common Prayer, and authored only by Francis Procter. This came out in a number of editions and printings through 1892. In1901 it was enlarged by Walter Frere and received its current title. This revision had a number of small changes over the years, and was reprinted many times. The book consists of two parts: Part 1 is a general history of the Book, along with several source documents. Part 2 (“the Rationale”) describes the services themselves. 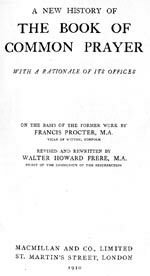 Walter Frere was a well-known Anglo-Catholic of his day, and the book does reflect some of that viewpoint, although as a whole it is even-handed. Note that there is a certain amount of untranslated Latin in this text; obviously the author assumed that the reader would know Latin. The text used here was a 1910 reprint of the “Third Impression, with corrections and alterations”. Notes which appear at the bottom of the page (and so numbered) in the original text are here grouped at the end of the chapter and renumbered. THE SOURCES AND RATIONALE OF THE OFFICES.